For 32 years, an enormous late-17th-century bed was kept in storage by the J. Paul Getty Museum in Los Angeles, too fragile to put on view for long. Before that, it resided in at least one French castle (legend has it that its hangings were stowed away in a casket in a castle prison cell during the French Revolution), on the set of a Racine drama and in the collection of a New York antiques dealer. It's one of the first things visitors see in the "Paris: Life & Luxury" exhibit on view at the Getty Museum through Aug. 7. Nearly 14 feet tall, it has yellow, embroidered silk side curtains and a canopy suspended from the ceiling, with no visible posts. "This is not a bed to lie down on," says Alice Zrebiec, an independent curator of textile arts who once worked at the Metropolitan Museum. "It was a place to receive guests and visitors. It was meant for display, and it shows the wealth and power of the family." The bed, known as a "lit à la duchesse," is also extremely rare. All of the fabric is silk, in contrast to other period beds, which often used coarser materials; the exquisite embroidery was done using green, crimson, turquoise and brown silk chenille and metallic threads. Beds of this format became popular in the 1690s, but went out of style about 100 years later. Only a few other complete examples survive, and they are in Europe; in the U.S., the few similar pieces that exist mix fragments from the period with modern, recreated components. When the Getty bought the bed in 1979, the New York antiques dealer who sold it said that it had come from the Château de Montbrian near Lyon. The bed, which incorporates two fleur-de-lys, is rumored to have been made for a favorite retreat of Louis XIV, though that has never been substantiated. It did make at least one appearance at Versailles, however: It was part of the set for Racine's tragedy "Esther," given there by the Comédie-Française in 1936. When "Paris: Life & Luxury" travels to the Museum of Fine Arts in Houston, where the exhibit opens in mid-September, the bed will not go along. 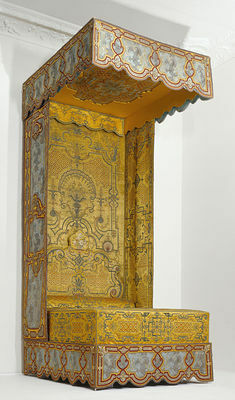 The Getty is sending another bed, of a different style and from a later period. This lit à la duchesse will return to slumber in storage.